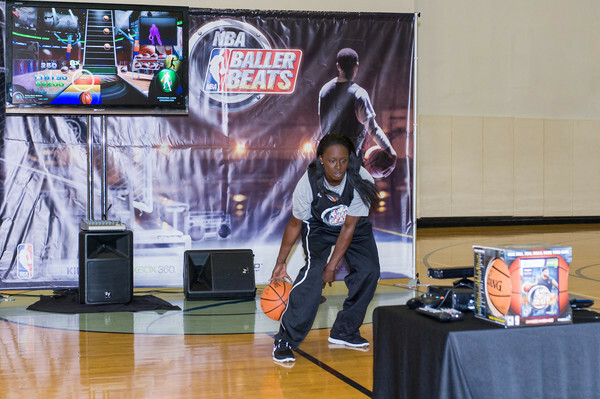 Will NBA Baller Beats Hit Or Miss? I have to admit I was somewhat suspicious about attending an event for Majesco Entertainment’s “NBA Baller Beats.” While Majesco has been a game publisher since 1986, they didn’t know how to market Tim Schafer’s brilliant adventure game, “Psychonauts.” And they didn’t sink enough money into “Advent Rising” or “BloodRayne” for the developers to finish them properly. A few of their kids’ games worked for me, like “A Boy and His Blob” and “Night at the Museum.” And “Jaws Unleashed” surprised by being a cut above. Yet their fitness games have left me unmoved. But the motion sensing game for Kinect has real challenges before it. First, it’s not a full basketball game. Rather, it’s a dribbling and ball handling game. There’s no shooting baskets. And then, there’s the marketing issue: the game comes with a full-sized basketball, making it difficult to places on retail shelves next to other games in traditional packages. Content-wise, the game comes with 30 songs, not nearly as many tunes as “Guitar Hero” and “Rock Band” included in their heydays. Despite these hurdles, at the very core of “NBA Baller Beats” is a good idea, certainly for those folks living in the suburbs who have basement rec rooms or large garages. Supposedly, any kind of ball that’s not black can be used with the game, so it might work with a Nerf ball or a dodge ball. Finally, I liked the initiative of Curtis R. Smith, the man who came up with the idea. “I went to everyone with the concept,” said Smith. After what Smith estimates are 300 emails and that many rejections, Majesco bit. 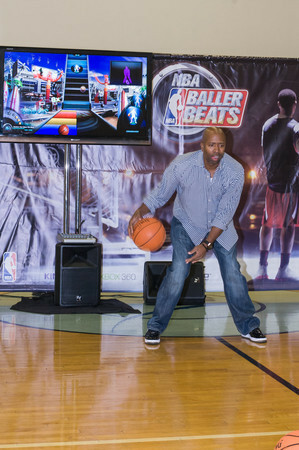 Just the other day, though, the Canadian studio that developed “NBA Baller Beats” shut down. But Smith remains undaunted and admirably enthusiastic. For that reason alone, I’m kind of rooting for “NBA Baller Beats” to succeed. Photos of Kenny Smith and Essence Carson by Tara Polen. ← Our First Community Event Is 7/31/12!